How can I report a bug or glitch in Legends of Equestria? We use a system called Phabricator to record all our bug reports; submitting any issues you encounter there is the best way to make sure the right people on the team know about it, and can work to fix it! You can learn more about how to use Phabricator here! What do I need to run Legends of Equestria? Will the game be free to play? The game will be free to play forever, with no premium access or downloadable content. Once you download the game, you get to play the whole thing! What races will be playable in the game? You will be able to play as an earth pony, a unicorn, or a pegasus. Other playable races aren’t currently planned, but that might change in the future! Will I be able to customize my own pony? Yes! Characters will have many customizable features, such as mane and tail styles, body colors, race, gender, eye color, accessories, and talent marks! Can I upload my own talent mark? The sheer amount of moderation that would be required to approve each individual talent mark would be too exhaustive in order to keep talent marks acceptable for everyone, so you cannot upload custom talent marks. We are, however, constantly working to bring you a wide variety of talent marks to choose from! Does that mean I don't get to earn my talent mark? Players will begin the game as fillies and colts, and will be able to earn a specific type of talent mark, which they will then be able to customize before transitioning into adulthood. So what types of talent marks will be in the game? Players will be able to sample multiple areas of specialisation before choosing their Talent, in fields such as magic, herbalism, mining, cooking, partying, and more! Depending on the Talent chosen, different pools of talent marks may be available to choose from. Yes! Pets can be earned through gameplay; helping other ponies deserves a reward, after all! What kinds of accessories will be in the game? The game will feature a large selection of accessories, including many varieties of hats, shoes, jewelry, saddles, armor, and much more. Especially socks. Oh, so many socks. What steps are being taken to ensure that the game is appropriate for children? We will have an extensive word filter within the game, along with a large and dedicated team of skilled moderators constantly keeping guard to ensure that all parts of our game maintain a child-friendly atmosphere. We have plenty of experience keeping our forum, Discord server, and the game itself during our previous Open Server Events safe and friendly for everybody, and will ensure that LoE remains a world for all to enjoy! There will be a combat system, but it will not contain any gratuitous violence which would make it inappropriate for minors. Combat won’t be the only option to play through LoE with! Will the game feature voice chat? Unfortunately the load on the servers would be too high. We recommend using your own Discord server, or a VOIP program such as Skype, Ventrilo, Teamspeak, etc. Word-of-mouth is very important, and we also encourage our users to plaster links to our website all over the rest of the internet in a giant viral marketing campaign that will spread our influence as far as possible. 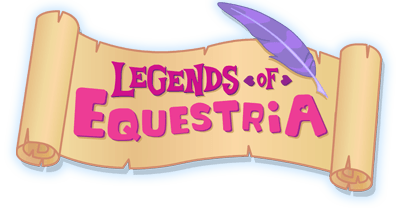 We don’t accept donations, and we aren’t interested in funding; Legends of Equestria has always been, and will always be, a free project created by passionate fans! Will the game feature transportation? Will the game feature voice-acting? Our Voice Acting team is committed to bringing our cast of main characters to life through sound, using our emotion engine for character dialogue. However, sound files can add up quickly, and could possibly be a limiter to what we are able to voice, so we do not wish to guarantee full voice-acting at this time. We use Unity3D, an excellent engine for independent game development! If you're interested in developing your own games for pony or non-pony related purposes, we recommend you go try it out, as it has a free version. How much are you willing to disclose about the storyline? Players will grow alongside a colourful cast of characters, learning about the world of Equestria – as well as themselves and each other – as they explore and adventure across the land. We have crafted a fully-fleshed story, as well as many side-stories, to ensure LoE has a narrative driving force; we don’t want to give that story away just yet, though! Can I have my own house? We don’t plan to have player houses or other such locations implemented into the game; it’s a lot of work, and it doesn’t really fit the tone and type of experience that we’re going for. It might be something we look into in the future, but for now our priorities are elsewhere! At this stage in development, we are not accepting applications on an individual basis, unless otherwise specified. We keep an updated list of the teams that are currently hiring on our website’s homepage; if you feel you can help out those teams, feel free to click the relevant link and submit an application!